Dubai, UAE, 20 January 2019: Carpet & Art Oasis 2019 kicked off under the patronage of Sultan bin Sulayem, DP World Group Chairman & CEO and Chairman of Ports, Customs and Free Zone Corporation (PCFC). Themed “Mix of art and innovation”, the 24th edition of the exhibition organised by Dubai Customs features more than 15,000 exquisite and rare carpets, and runs from 20th January to 14th February. 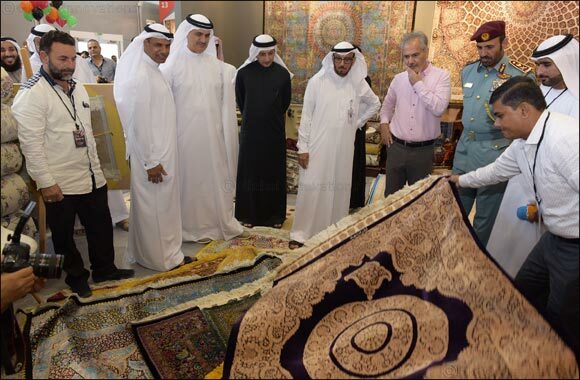 It was inaugurated in the presence of Ahmed Mahboob Musabih, Director of Dubai Customs, executive directors, consul generals of different countries, and owners of carpet companies taking part in the Carpet & Art Oasis. The Carpet & Art Oasis is expected to draw thousands of tourists, especially for rug lovers who flock every year to the exhibition. It is a manifestation of the emirate’s diverse economy and attractive and strong touristic offering. Different countries are taking part in the 24th edition of the exhibition including Turkmenistan which participates for the first time, along with 15 local companies. A number of activities will take place during the exhibition, including a wall mural on the theme of tolerance which was painted to enhance the role of the UAE as an ideal place for co-existence and peaceful life. A kids’ corner will make the day for many young visitors who will have the chance to make slime, draw, color and read stories. Among the participants is Ms Suhaila Al Khazali, the first Emirati female carpet manufacturer. She is there to raise awareness around the great value of this art and profession and to train 27 women how to make carpets. Sultan bin Sulayem commented: “There is more than one thing that makes this exhibition different than any other, which is the uniqueness of the carpets coming from different famous countries along the silk road. The Carpet & Art Oasis is an annual event that promotes Dubai as a world tourist and business hub in line with the eight principles of governance launched by His Highness Sheikh Mohammed bin Rashid Al Maktoum, Vice President and Prime Minister and Ruler of Dubai and in fulfilment of the 50-Year Charter development plan. Organizing these events reflects the efforts of PCFC in encouraging and facilitating legitimate trade and supporting the national efforts in hosting the EXPO 2020”. On his part, Ahmed Mahboob Musabih said: “The Carpet & Art Oasis has made noticeable success for 24 consecutive years since its launch for the first time in 1996. The exhibition, a key event of the Dubai Shopping Festival, is among a few exhibitions in the world to focus on handcrafted silk and wool carpets.